Peacefully on May 9, 2018 at the age of 91. Betty was formerly of Spring Hill and a resident of Valencia. Wife of the late Frederick M. Tate. Loving mother of Donna (Peter) Peduzzi, Terry (Clay) Fuller and Jeff (Jackie) Tate. Devoted grandmother of Trina, Peter, Casie, Emily, Keegan, Alex, Ethan and Cody. She is also survived by 8 Great-grandchildren. To send flowers or a remembrance gift to the family of Elizabeth "Betty" L. (Ehrenbeger) Tate, please visit our Tribute Store. A funeral Mass will be celebrated in St. Catherine of Sweden Church Monday at 9:30AM. 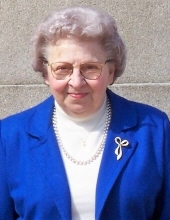 "Email Address" would like to share the life celebration of Elizabeth "Betty" L. (Ehrenbeger) Tate. Click on the "link" to go to share a favorite memory or leave a condolence message for the family.